Wayne Nishijima, the associate dean and associate director for cooperative extension at the University of Hawaii College of Tropical Agriculture and Human Resources, is being recognized for his community service. 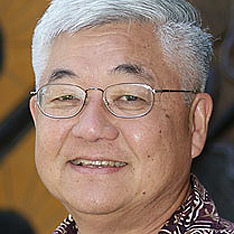 Nishijima is the recipient of the 2006 Willard Wilson Award, which will be presented in a ceremony in September. Nishijima oversees outreach programs on Kauai, Oahu, Maui, Molokai, and the Big Island and has worked on papaya diseases and anthurium blight. Mayor Mufi Hannemann was in a city vehicle that got into a minor traffic accident on his way to Kapiolani Park yesterday, city spokesman Bill Brennan said. Hannemann was a passenger in a blue Ford sports utility vehicle driven by another city employee that slid on a wet road and collided with a guardrail on the eastbound exit ramp from the H-1 Freeway at Halawa Heights, Brennan said. The mayor was wearing his seatbelt and neither the mayor nor the driver were injured, Brennan added. The car received minor damage. Police said the accident occurred at 11:15 a.m.
Hannemann was on his way from a morning event in Waipahu to the Korean Festival at Kapiolani Park, Brennan said. After the accident, the city car was driven to a location for it to be checked out, while Hannemann continued to the festival in another vehicle, he said. Police responding to the accident told the mayor that the location was "notorious" for accidents, Brennan said. 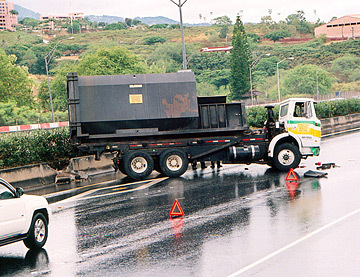 A garbage truck hit the median at about 1 p.m. yesterday on the eastbound portion of the Moanalua Freeway across from Kaiser Medical Center. A 48-year-old Wailua man drowned Friday evening while surfing near the Beach House Restaurant in Koloa, the Kauai Fire Department reported. Witnesses said he was seen riding a wave around 7:15 p.m. and shortly afterward was found face down in the water by surfers who brought him to shore. Bystanders performed CPR on him until firefighters arrived. The victim was transported to Wilcox Hospital where he was pronounced dead. This is the eighth drowning victim on Kauai this year. Police closed two lanes of the Moanalua Freeway for about three hours yesterday afternoon while an overturned garbage truck and a car were removed from the roadway. The accident occurred just before 1 p.m. yesterday in the eastbound lanes near the Ala Kapuna overpass. Police closed the two left lanes of the freeway while they cleared the scene. The lanes were re-opened by 4 p.m. There were no serious injuries, a police dispatcher said.